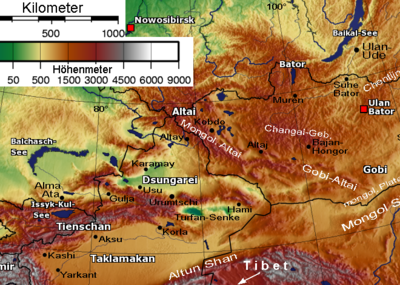 Dzungar (also Jungar or Zungar; Mongolian: Зүүнгар Züüngar) is the collective identity of several Oirat tribes that formed and maintained the last nomadic empire in East Turkestan (now known as Xinjiang) from the early seventeenth century to the middle eighteenth century. After the death of Esen Tayishi in 1454, a unified Mongolia had disintegrated into nomadic Olöt, Choros, Dörbet, Torghut, Khoshut, and Khoit tribes, each with its own hereditary leader, or tayishi. Around 1600, Khara Khula (d. 1634) emerged as tayishi (hereditary leader) of the Choros, the dominant tribe, and united the Olöt, Derbet and Khoit tribes, to fight against the Eastern Mongolian Khalkans led by Ubasi Khun Tayishi, who were taking over Oirat pasturelands. Khara Khula's son, Erdeni Batur (d. 1653), forged a new Oirat state, the Dzungar Khanate, shortly after his father's death in 1634. The Dzungars defeated the Kazakhs to their west, negotiated trade agreements with Russia, gained the support of the Dalai Lama in Tibet, established a universal legal code for the Mongols, called the "Great Code of the Forty and the Four" (Döchin Dörben Hoyar un Ike Tsagaza), and adopted Buddhism as the state religion. The Dzungars invaded Tibet in 1717, but were expelled by the armies of Chinese Emperor Kangxi in 1720. During the eighteenth century, the Dzungars were annihilated by Qing Dynasty in several campaigns. Approximately 80 percent of the Dzungar population, between 500,000 and 800,000 people, were killed during or after the Manchu conquest in 1755-1757. The Dzungars were a confederation of several Oirat tribes that emerged suddenly in the early seventeenth century to fight the Altan Khan of the Khalkha (not to be confused with the more well-known Altan Khan of the Tümed), the Jasaghtu Khan, and their Manchu patrons for dominion and control over the Mongolian people and territories. This confederation rose to power in the Altai Mountains and the Ili River Valley. Initially, the confederation consisted of the Olöt, Derbet and Khoit tribes. Later on, elements of the Khoshot and Torghut tribes were forcibly incorporated into the Dzungar military, thus completing the re-unification of the West Mongolian tribes. According to oral history, the Olöt and Derbet tribes are the successor tribes to the Naiman, a Turco-Mongol tribe that roamed the steppes of Central Asia during the era of Genghis Khan. The Olöt shared the clan name Choros with the Dörbed and their ancestral legend resembles that of the Uyghur royal family. The word "Dzungar" is a compound of Züün, meaning "left" or "east" (in Mongolian, "left" is synonymous with "east," "right" is "west," "in the front" is "south," and "in the back" is "north"), and gar meaning "hand" or "wing." The region of Dzungaria derives its name from this confederation. Although the Dzungars were located west of the East Mongols, the derivation of their name has been attributed to the fact that they represented the left wing of the Oirats. After the death of Esen Tayishi, who led the Dörben Oirat from 1439 to 1454, and unified Mongolia (both Inner and Outer) under his rule, the political and military unity of the Oirat (or West Mongolian) tribes quickly disintegrated. The coalition dissolved into traditional tribal divisions, including the Olöt, Choros, Dörbet, Torghut, Khoshut, and Khoit, each with its own hereditary leader, or tayishi. For the next 150 years, the Oirats were not able to form a cohesive political and military entity to combat their enemies and to decide internal disputes. From the fourteenth until the middle of the eighteenth century, the Oirats were often at war with the East Mongols. At the beginning of the seventeenth century, the Oirat tribes were roaming the pastureland between the Irtysh and the Ili rivers. They had been pressured to migrate west to that area from their home in the Altai Mountains by Sholui Ubasi Khun Tayishi, the first Altan Khan of the Khalkha, a leader of the East Mongols who was expanding his state by robbing the Oirats of their valuable pastures. Around 1600, Khara Khula (d. 1634) succeeded his father, Bulai (or Abuda Ablai Tayishi) as tayishi of the Choros, the dominant Oirat tribe. His birth name was "Khutugaitu," but historians identify him as “Khara Khula,” a nickname given by his father describing a lion-like, dark-colored animal from the Altai Mountains that Khutugaitu is supposed to have killed. In 1606, early in his reign, Khara Khula emerged from his base in the upper Irtysh river and Tarbagatai Mountains region to rally the unorganized and confused Oirat tribes against Ubasi Khun Tayishi. In 1608, the Oirat forces defeated the Kazakhs to their west. By 1609, Khara Khula had won a decisive victory against Ubasi Khun Tayishi, forcing the Altan Khanate to withdraw from Oirat territory in the Kobdo region of present-day northwest Mongolia. Soon after this victory, some Oirat princes, no longer fearing Ubasi Khun Tayishi, resumed their traditional nomadic ways, favoring independence over centralization, and the united front dissolved. Khara Khula was a direct descendant of Esen Tayishi and, like Esen, was also the tayishi of the Olöt tribe. Khara Kula united the Olöt, Derbet and Khoit tribes, to form the Dzungar nation. As the leader of three tribes, Khara Khula could only assume the title “Khong Taiji” (Supreme Chief); during this era, only the leader of the Khoshot tribe could claim the title of Khan. A string of victories emboldened Khara Khula to take control of the salt mines near the Russian outpost at Tara in 1610 and demand payment for the salt from the neighboring Cossacks and Siberian nomads. The Cossacks retaliated by attacking the Oirats and clashes continued until 1613, when Russian settlers discovered an alternative source of salt at Lake Yamysh. This lake was located in Dzungar terrority and was a source of conflict between the Cossacks and the Oirats over the next 20 years. In 1614, a severe winter killed off livestock, further weakening the Oirats. Ubasi Khun Tayishi, sufficiently recovered from his earlier defeat, undertook a second assault, and in 1615, won a major victory against the Oirats. A number of Oirat princes submitted themselves as vassals to the Altan Khanate, while other Oirat princes fled north into southern Siberia seeking the protection of Russia, and still others sought refuge with the Kazakhs. Through the mid-1620s, Ubashi Khun Tayishi continued to annex Oirat land and defeated the forces of Khara Khula again and again. Khara Khula solidified his base of support and began launching counter-attacks, culminating in the death of Ubasi Khun Tayishi around 1627. The Oirat epic song, "The Rout of Mongolian Shulum Ubushi Khong Tayiji," tells about the war between the Oirats and the first Altan Khan of the Khalkha. Khara Khula regained the Oirat lands that Ubashi Khun Tayishi had taken for the Altan Khanate. Ubashi's son and successor, Badma Erdeni Khun Tayishi, was not able to duplicate his father's success and did not pose a threat to the Oirats. As Khara Khula’s power and prestige grew, the Oirat princes felt his dominance over them. The leaders of the Torghut tribe, who wished to maintain the freedoms they had once enjoyed without a central political figure, migrated with the Torghuts from their encampments in southern Siberia to the pasture lands off the Volga river in southeastern Russia. This lowered the population and eased the pressure of livestock on the pastures of southern Siberia, further enabling Khara Khula's son, Erdeni Batur (d. 1653), to forge the remaining Oirat tribes into a new Oirat state, called the Dzungar Khanate, shortly after his father's death in 1634. In 1636, Erdeni Baatur joined a Oirat expeditionary force to Tibet, led by Güshi Khan of the Khoshot tribe, and assumed the title Khong Tayiji. After he returned to Dzungaria, the Dzungars rapidly gained strength. Upon becoming ruler of the Dzungars, Erdeni Batur sought to consolidate his position around the Tarbagatai Mountains, the rangeland his people roamed. He led the Dzungars in three victorious military campaigns against the Kazakhs to his west. To the north in southern Siberia, Erdeni Batur gave Russia access to salt mines, ending the 20-year conflict, in exchange for diplomatic and trade relations. The commercial ties, which remained intact throughout his rule, and the prosperity generated by trade with Russian outposts contributed to Erdeni Batur's prestige among the Oirats and the leaders of adjacent nations. Within the Dzungar Khanate, Erdeni Batur carried out on an ambition campaign of nation building. He established a capital city called Kubakserai north of Lake Zaisan on the Imil River, near the modern city of Chuguchak, and built monasteries throughout Dzungar territory. He also encouraged his people to practice Buddhism, to settle down in the new capital and to engage in both agriculture and small-scale manufacturing, like masonry and metal crafting. Like his father, Erdeni Batur sought to build the Dzungar nation into a powerful and independent khanate capable of challenging the Qing Empire for control of Central Asia. His attempts to impose unity on the Oirat tribes were only partially successful. The dissension and skirmishes compelled Güshi Khan and his brother, Kundelung Ubasha, to move a substantial part of the Khoshot-Oirat tribe from the Lake Zaisan area to the area around Koko Nor in the Amdo region of Tibet in 1636, where they soon established the Khoshot Khanate and became the protector of Tibet. The unity Erdeni Batur created among the remaining Oirat tribes, the Choros, Dörbet and Khoit tribes, further strengthened his power and his resolve to establish the Dzungar Khanate as the preeminent power in Central Asia. The Fifth Dalai Lama took note of the rising power and influence of the Dzungar Khanate and granted Erdeni Batur the title, "Khun Tayiji" (Crown Prince) for the military support he provided Güshi Khan in toppling the enemies of the Gelugpa Order. By granting this title, the Fifth Dalai Lama hoped to secure another ally to protect and promote the cause of the Gelugpa Order. His increased stature and the wide recognition of the Dzungar Khanate as a great power among Central Asian nomads prompted Erdeni Batur to call for a pan-Mongolian entente in 1640. The entente took place inside Dzungar territory at a place called Ulan Buraa, near the Tarbagatai Mountains on the border between what is now the Xinjiang province of China and Kyrgyzstan. The ruling princes of all Mongolian tribes were present, except for the Mongolian tribes of southern Mongolia which had recently come under the dominion of the Qing Empire. One purpose of the entente was to form a pan-Mongol coalition against all potential external enemies, such as the Kazakhs and the newly emerging Qing Empire (Manchus). A second purpose was to devise a method by which disputes could be resolved peacefully. A legal code was drafted, establishing a system of rules that governed the daily activities of all Mongols from the Volga River in southeastern Russia to present-day eastern Mongolia. This set of laws is known as the "Great Code of the Forty and the Four" (Döchin Dörben Hoyar un Ike Tsagaza), or the Khalkha-Oirat Law. The attempt to institute a pan-Mongol coalition failed. The Khalkha Mongol princes did not want to submit to Erdeni Batur as their leader because they still claimed that, as the direct descendants of Genghis Khan, they were the rightful leaders of the Mongols. Erdeni Batur succeeded in instituting a standard code of laws and in making Buddhism the official religion throughout the Mongol realm. After the entente, Erdeni Batur continued to prepare the Dzungar Khanate for its inevitable challenge to the Qing for control over Central Asia. Before his death in 1653, Erdeni Batur name his third son, Sengge (d. 1671) , as his successor, to the consternation of his two older half-brothers, Tseten and Tsobda Batur. Erdeni Batur, believing Sengge was the ablest of his eight sons, gave him the southern half of the Khanate. The northern half was to be divided among Erdeni Batur's remaining seven sons. The fourth son, Galdan, transferred his rights to Sengge and entered a monastery. Sengge's brothers Tseten and Tsobda Batur made several attempts to assassinate him. Though they did not succeed until 1671, the continuous, internecine warfare caused Sengge to neglecting the legacy his father and grandfather, Khara Khula, had forged in building the Dzungar Khanate into a powerful Central Asian nation-state. Sengge was not able to immediately exert control of the northern half of the Dzungar Khanate, and was powerless to enforce the commercial trading agreement his father, Erdeni Batur, had signed with Russia years earlier and honored throughout his reign. The Oirat tribes roaming the northern border returned to the traditional nomadic practice of banditry, crossing into Russian territory in southern Siberia to raid nearby Russian outposts and steal the items they had previously acquired by trade. Russia was compelled to engage in dialogue with numerous chiefs of small Oirat clans, to no avail. Sengge demanded that Russia stop claiming tribute from the small Siberian tribes that he considered to be the vassals of the Dzungar Khanate. Several skirmishes occurred between the Cossacks and the Dzungar forces during Sengge’s reign and the conflict was unresolved at the time of his death. An internal conflict between Sengge and his half brother Tseten Tayiji involved the Khoshot tribe. With the support of Ochirtu Khan of the Khoshot, Sengge emerged victorious in 1661. In 1667 he captured Erinchin Lobsang Tayiji, the third and last Altan Khan, and eliminated the Altan Khanate as a potential future threat to the Dzungar Khanate. Sengge was killed by Tseten Tayiji during a coup in 1670. Sengge's younger brother Galdan (1644-1697) immediately returned to secular life and took revenge on Chechen. Galdan, the fourth son of Erdeni Batur and the grandson of Güshi Khan, the first Khoshut-Oirat King of Tibet, had gone to Tibet at the age of thirteen and had trained as a Buddhist priest under the fourth Panchen Lama and the Fifth Dalai Lama. In 1671 the Dalai Lama bestowed the title of Khan on him. Galdan came into conflict with Ochirtu Khan of the Khoshot tribe, and his victory over Ochirtu in 1677 established hegemony over the Oirats. In the next year the Dalai Lama gave the highest title of Boshughtu Khan to Galdan. During Galdan's rule, Dzungaria embraced Eastern Turkistan and parts of Central Asia, which he conquered by 1679. He founded Kobdo city as his military garrison. To oppose the expansion of the Manchu Empire, Galdan attempted to unify Mongolia by occupying Khalkha in 1688. While he was fighting in Eastern Mongolia, his nephew Tsewang Rabtan seized the Dzungarian throne in 1689. After a series of successful battles in the Khangai mountains, at Lake Olgoi and Ulahui river, Galdan approached the Great Wall. The Khalkha leaders retreated to Inner Mongolia with their troops and the Khalkha territory fell under Galdan's rule. The Qing deceived him by calling him to Beijing to arrange a treaty. He was ambushed at Ulaan Budan by Khalkha troops supported by the Qing army, and after a serious defeat, Galdan retreated to Khalkha. The Qing Emperor crossed the Gobi to invade Khalkha, and Galdan's troops were surrounded by the overwhelming Qing army at a site Zuunmod at the river Terelj in 1696. Galdan was freed from the encirclement by his spouse Queen Anu who lost her life during the battle. With his remaining troops, Galdan retreated to Kobdo where he committed suicide in 1697 to avoid being captured by the enemy. The Dzungars invaded Tibet in 1717, deposed and killed a pretender to the position of Dalai Lama who had been promoted by Lhabzang, the titular King of Tibet, an action which was widely supported. The Dzungars soon began to loot the holy places of Lhasa, eliciting a swift response from Emperor Kangxi in 1718, but his military expedition was annihilated by the Dzungars not far from Lhasa. Many Nyingmapa (followers of the oldest of the four major schools of Tibetan Buddhism) and Bonpos (followers of the ancient Bon spiritual tradition) were executed and Tibetans visiting Dzungar officials were forced to stick their tongues out so the Dzungars could tell if the person recited constant mantras (a practice which was said to make the tongue black or brown). The Nyingmapa and Bonpos, who recited many magic-mantras, were said to have black tongues. This habit of sticking one's tongue out as a mark of respect on greeting someone has remained a Tibetan custom until recent times. During the eighteenth century, the Dzungars were annihilated by Qianlong Emperor in several campaigns. In 1755, the Qing Dynasty attacked Ghulja, and captured the Dzunghar khan. Over the next two years, the Manchus and Mongol armies of the Qing Dynasty destroyed the remnants of the Dzunghar khanate. Their last leader, the rebellious Prince Amursana, fled to the North to seek refuge with the Russians. Approximately 80 percent of the Dzungar population, between 500,000 and 800,000 people, were killed during or after the Manchu conquest in 1755-1757. To commemorate his military victory, Qianlong established the Puning Temple Complex of Chengde in 1755. The Manchus brought immigrants from many parts of their empire to occupy the depopulated area, but a century later the Muslim Rebellion ravaged the same region. ↑ 1.0 1.1 Hugh E. Richardson, Tibet and its History (Boston, MA: Shambhala, 1984, ISBN 0-87773-376-7). ↑ R.A. Stein, Tibetan Civilization (Stanford University Press, 1972, ISBN 0-8047-0806-1). ↑ Namkhai Norbu, "Bon and Bonpos," Tibetan Review (December, 1980): 8. ↑ Michael Edmund Clarke, In the Eye of Power. Retrieved December 4, 2008. Bawden, C. R. The Modern History of Mongolia. London: Kegan Paul International, 1989. Bergholz, Fred W. The Partition of the Steppe: The Struggle of the Russians, Manchus, and the Zunghar Mongols for Empire in Central Asia, 1619-1758: A Study in Power Politics. American University Studies, Series IX, History, Vol. 109. New York, NY: Peter Lang Publishing, 1993. ISBN 9780820415758. Clarke, Michael Edmund. In the Eye of Power (doctoral thesis). Brisbane, 2004. Retrieved December 4, 2008. Grousset, René. The Empire of the Steppes: A History of Central Asia. New Brunswick, NJ: Rutgers University Press, 1994. ISBN 9780813506272. Howorth, Henry H. History of the Mongols: From the 9th to the 19th Century: Part I. The Mongols Proper and the Kalmuks. 1964. Norbu, Namkhai. "Bon and Bonpos." Tibetan Review, December, 1980. Perdue, Peter C. China Marches West: The Qing Conquest of Central Eurasia. Cambridge, MA: Belknap Press of Harvard University Press, 2005. ISBN 9780674016842. Richardson, Hugh E. Tibet and its History, 2nd ed. Boston: Shambhala, 1984. ISBN 0-87773-376-7. Stein, R. A. Tibetan Civilization. Stanford University Press, 1972. ISBN 0-8047-0806-1. Zlatkin, Ilia Iakovlevich. История Джунгарского ханства, 1635-1758. (History of the Jungarian Khanate, 1635-1758 ). 1964. This page was last modified on 14 July 2016, at 15:46.